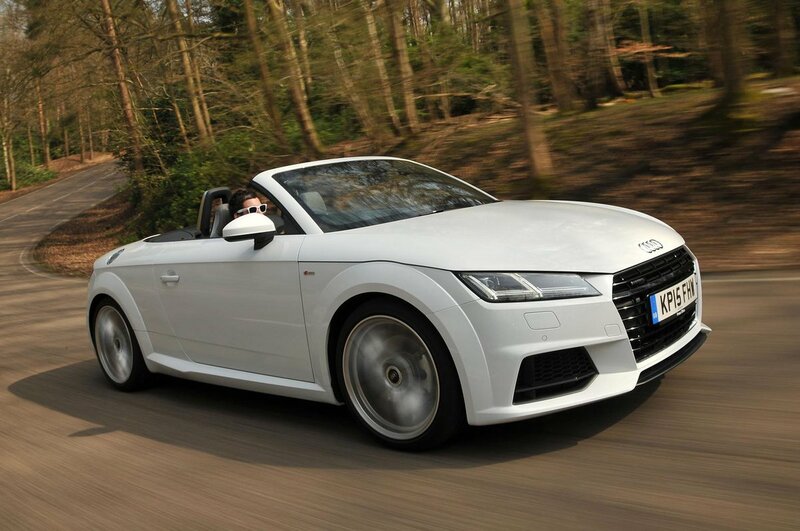 Audi TT Roadster Performance, Engine, Ride, Handling | What Car? The entry-level 1.8-litre engine in the TT Roadster range doesn’t feel underpowered, being happy to rev and pulling hard from low down in its range. Its linear power delivery, peppy performance and affordable running costs mean it’s our favourite engine in the range. However, the 2.0-litre petrol version is well worth considering; it feels fast at almost any revs, and will hit 62mph in a shade over 6.0 seconds. It is available in both front and four-wheel drive form, and although the latter will ultimately accelerate quicker, the four-wheel-drive system only really comes into its own when the roads are damp and slippery. The 306bhp, four-wheel drive TTS, accelerates almost as quickly as a Porsche 911 Cabriolet but it’s expensive and not as much fun as a similarly priced Porsche Cayman. At the top of the range sits the TT RS, which has a 2.5-litre turbocharged five-cylinder petrol engine that produces 394bhp. If you’re interested in that, then click here as the RS gets its very own review. At the other end of the scale is the TDI diesel, which is still quick. In fact, in most situations it feels virtually as quick as the entry-level petrol thanks to its muscular medium-rev shove. Chopping the roof off a car doesn’t usually do ride comfort any favours, because the whole body tends to become a bit loose and wobbly. Thankfully, that’s not the case at all with the TT Roadster; it’s remarkably stiff for a drop-top, so bumps are dealt with in one go rather than causing reverberations through the cabin. The standard suspension (fitted to Sport and S line versions) gives a firm but generally comfortable ride, and even the S line’s optional sports set-up doesn’t make things too bumpy. It’s worth avoiding the temptation of large wheels (up to 20in items are available) if you value comfort over sporty looks, because they make the ride harsher. Range-topping TTS models come with adaptive shock absorbers, which allow you to stiffen or soften the suspension. They’re effective and certainly make a difference to comfort levels. They’re optional on cheaper models, but are not worth paying extra for. The TT RS, on the other hand, comes with a 10mm lower than standard suspension set-up without adaptive dampers. They're an option, but we'd say you needn't bother, because the standard suspension is firm but never uncomfortable. 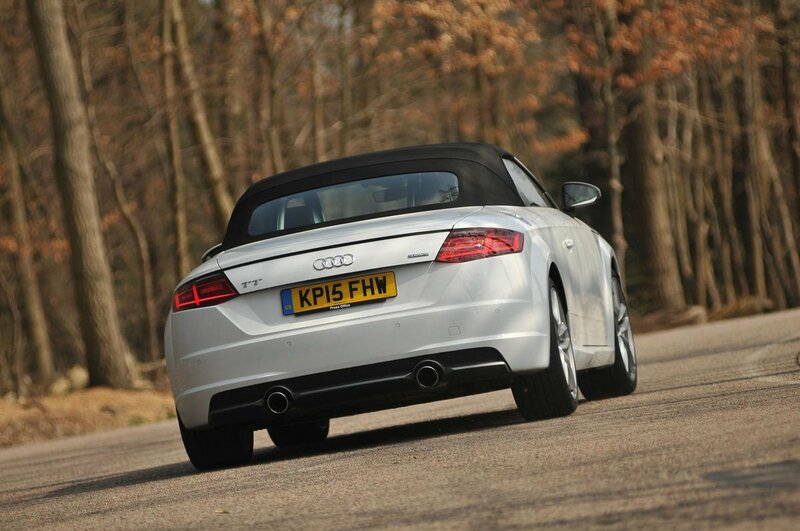 The TT Roadster is lighter than rivals such as the BMW Z4, and it feels it. Turn the wheel and the Audi dives in to bends, gripping hard and with barely any body lean – especially in the high-powered TTS and other versions equipped with the stiffer sports suspension. The light, accurate steering also gives you plenty of confidence to push the TT hard, making it easy to judge whether you need to back off a bit. In damp conditions, front-wheel-drive TTs can struggle to transfer all of their power to the road – particularly when moving briskly away from a standstill or on the way out of corners – but the four-wheel-drive (quattro) versions are almost unflappable. A two-seater roadster is never going to be as quiet as a luxury car, although the TT Roadster does a good job of keeping the outside world outside. There’s some wind noise from around the frameless windows and you can also hear road noise, but the TT is a pretty quiet cruiser with the hood up – certainly when compared with rivals such as the Mercedes SLC. The petrol engines are smooth and hushed at low revs and sounds suitably rorty when you work them hard. Unsurprisingly, the diesel is noisier – and not in a good way. Fold down the fabric roof and, unsurprisingly, things do become breezy. However, an electrically operated wind deflector is available as an option and takes the edge of the gale blowing through the cabin, turning the TT in to a pretty decent open-topped tourer. The six-speed manual gearbox has a light and accurate shift, although we’d prefer a slightly shorter action. The S tronic automatic ’box (standard on the four-wheel-drive petrol model, and an option on the front-wheel-drive petrol and the TTS) is generally slick, if a bit jerky when manoeuvring.